On Wednesday 26 September, the College farewelled the Class of 2018. This year’s Graduation Day was held in a different format to previous years with a number of firsts taking place. The day started at 8.00am with the boys and their Homeroom teachers sharing a Graduation Breakfast together during which speeches of thanks were given and gifts dispersed. This joyous occasion was followed by the Graduation Assembly which was attended for the first time by the parents of the cohort. The Assembly was also expanded to include the Year 12 Prize Giving which in the past had occurred at Speech Night. The Presentation of Graduands also took place at the Assembly, rather than at the Mass and the audience was entertained by speeches from Principal Dr Craig Wattam, Year 12 Coordinator Mr Justin Newman and College Captain Matthew Bryson. 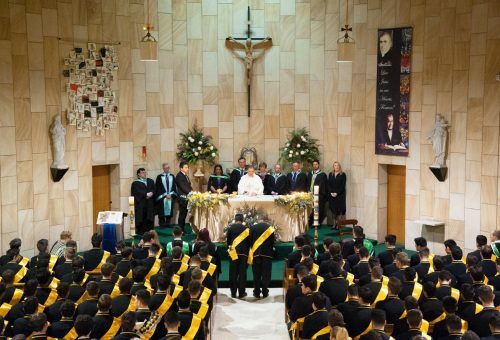 At 5.00pm the Graduation Mass was held in the College Chapel which nearly lost its roof to the singing of the Year group – the best in memory! The day concluded with the Graduation Dinner at Le Montage at which Mr Michael Mynett (Class of 1984) and his wife Loretta, gave the toast to the College on behalf of the parents. Congratulations to all the boys who now enter the ranks of the Old Boys.